Authors: Halavaty, A., Mueller, J.J., Contzen, J., Jung, C., Hannemann, F., Bernhardt, R., Galander, M., Lendzian, F., Heinemann, U. 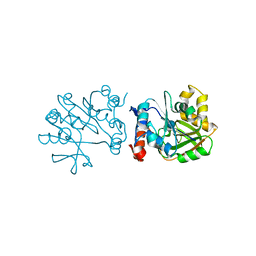 Cite: Light-Induced Reduction of Bovine Adrenodoxin Via the Covalently Bound Ruthenium(II) Bipyridyl Complex: Intramolecular Electron Transfer and Crystal Structure. 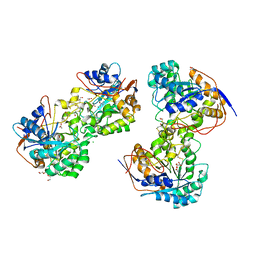 1.5 ANGSTROM CRYSTAL STRUCTURE OF GLUCOSE-6-PHOSPHATE ISOMERASE FROM VIBRIO CHOLERAE. 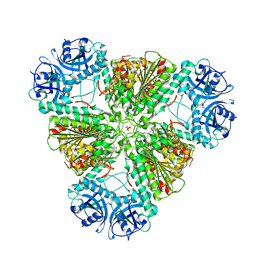 Cite: 1.5 Angstrom Crystal Structure of Glucose-6-phosphate Isomerase from Vibrio cholerae. 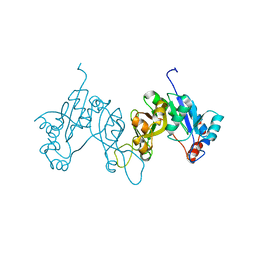 2.76 ANGSTROM CRYSTAL STRUCTURE OF A PUTATIVE GLUCOSE-1-PHOSPHATE THYMIDYLYLTRANSFERASE FROM BACILLUS ANTHRACIS IN COMPLEX WITH A SUCROSE. 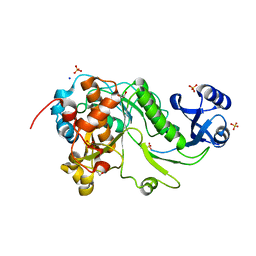 Cite: 2.76 Angstrom Crystal Structure of a Putative Glucose-1-Phosphate Thymidylyltransferase from Bacillus anthracis in Complex with a Sucrose. 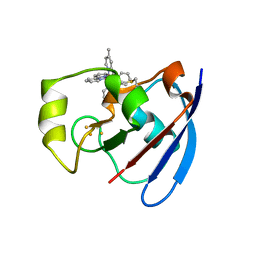 CRYSTAL STRUCTURE OF SHORT CHAIN DEHYDROGENASE (YCIK) FROM SALMONELLA ENTERICA SUBSP. ENTERICA SEROVAR TYPHIMURIUM STR. 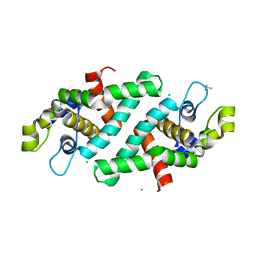 LT2 IN COMPLEX WITH NADP AND ACETATE. 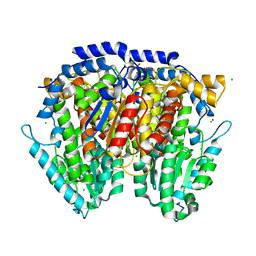 Cite: Crystal Structure of Short Chain Dehydrogenase (yciK) from Salmonella enterica subsp. enterica serovar Typhimurium str. 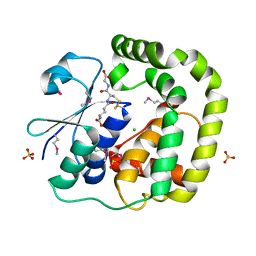 LT2 in Complex with NADP and Acetate. 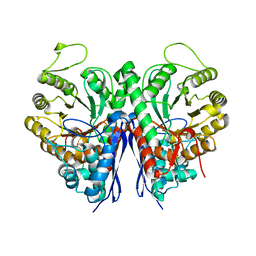 1.55 ANGSTROM RESOLUTION CRYSTAL STRUCTURE OF PEPTIDASE T (PEPT-1) FROM BACILLUS ANTHRACIS STR. 'AMES ANCESTOR'. 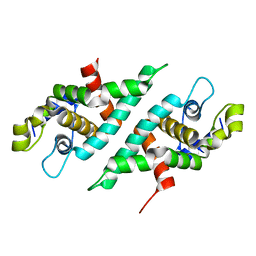 Cite: 1.55 Angstrom Resolution Crystal Structure of Peptidase T (pepT-1) from Bacillus anthracis str. 'Ames Ancestor'. 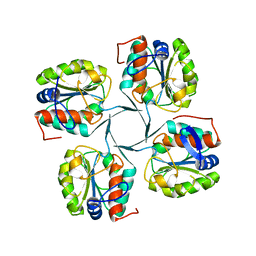 Cite: 1.2 Angstrom Crystal Structure of the Glutaredoxin 2 (grxB) from Salmonella typhimurium in complex with Glutathione. 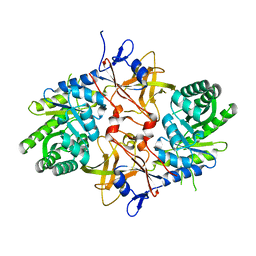 Cite: 1.8 Angstrom Resolution Crystal Structure of Dihydroorotase (pyrC) from Salmonella enterica subsp. enterica serovar Typhimurium str. LT2. 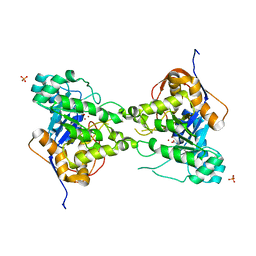 Cite: 2.1 Angstrom Resolution Crystal Structure of Glycerol-3-phosphate Dehydrogenase (gpsA) from Coxiella burnetii. 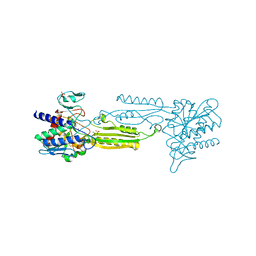 1.8 ANGSTROM RESOLUTION CRYSTAL STRUCTURE OF ENOYL-COA HYDRATASE FROM BACILLUS ANTHRACIS. 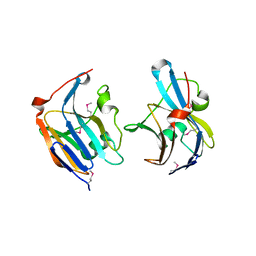 Cite: 1.8 Angstrom Resolution Crystal Structure of Enoyl-CoA Hydratase from Bacillus anthracis. 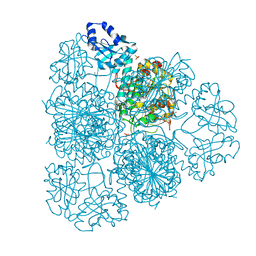 1.8 ANGSTROM RESOLUTION CRYSTAL STRUCTURE OF DIAMINOPIMELATE DECARBOXYLASE (LYSA) FROM VIBRIO CHOLERAE. 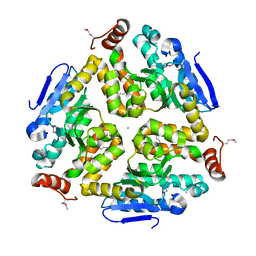 Cite: 1.8 Angstrom Resolution Crystal Structure of Diaminopimelate Decarboxylase (lysA) from Vibrio cholerae. 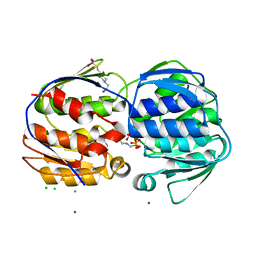 Cite: 2.0 Angstrom Crystal structure of Glutamate--Cysteine Ligase (gshA) ftom Francisella tularensis in Complex with AMP. 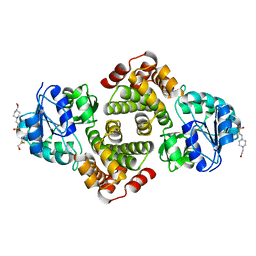 Cite: Structural Flexibility in Region Involved in Dimer Formation of Nuclease Domain of Ribonuclase III (rnc) from Campylobacter jejuni. 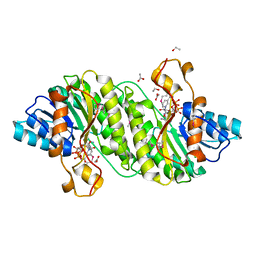 Cite: 2.2 Angstrom Resolution Crystal Structure of putative UDP-N-acetylglucosamine 2-epimerase from Listeria monocytogenes. 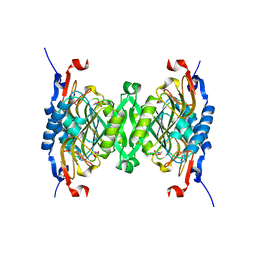 Cite: The structure of bradyzoite-specific enolase from Toxoplasma gondii reveals insights into its dual cytoplasmic and nuclear functions. 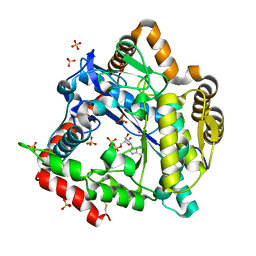 2.4 ANGSTROM CRYSTAL STRUCTURE OF DIHYDROOROTASE (PYRC) FROM CAMPYLOBACTER JEJUNI. 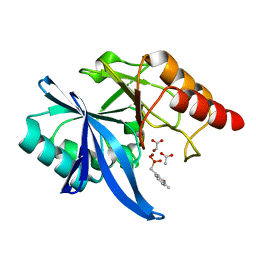 Cite: 2.4 Angstrom Crystal Structure of Dihydroorotase (pyrC) from Campylobacter jejuni. 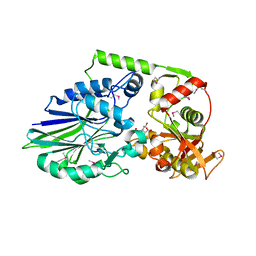 2.3 ANGSTROM CRYSTAL STRUCTURE OF 3-DEOXY-MANNO-OCTULOSONATE CYTIDYLYLTRANSFERASE (KDSB) FROM ACINETOBACTER BAUMANNII. 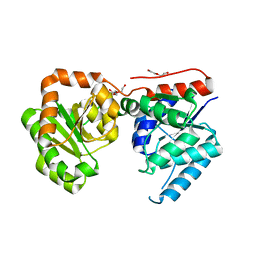 Cite: 2.3 Angstrom Crystal Structure of 3-deoxy-manno-octulosonate Cytidylyltransferase (kdsB) from Acinetobacter baumannii.